When you surf, your brain is going haywire, but in a coordinated fashion. Specifically, dozens of maps in your brain are coding the position of the wave and the positions of the surfers around you. 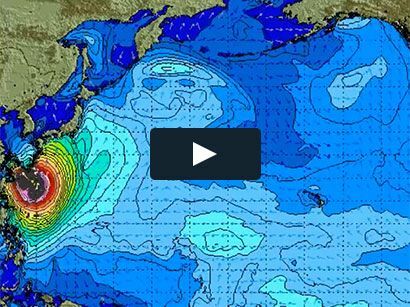 Appealing to all surfers, identifying these maps requires what’s referred to as the traveling wave technique. 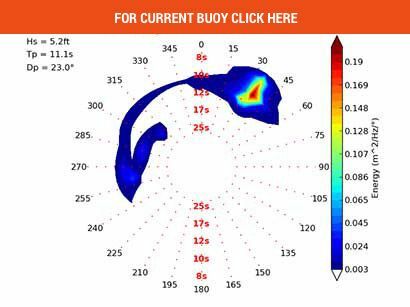 Without one particular area, area MT, your life as a surfer would be nearly impossible because it codes for different directions of motion. Attention affects memory. If you do not specifically attend to particular things, it’s as if you didn’t see them at all. So, to read waves better, attend to the details of the waves and how they move, and you will begin to see details that you haven’t noticed before (probably because you were too busy talking in the lineup and annoying everyone else). Some people read waves better than others. Think Kelly Slater in the dying minutes of a heat or that dude who always seems to find the hole to poke through in your local heaving beachbreak. Some of this ability comes with experience of course, but without certain brain structures, none of us would be able to see what a wave is doing or update in real-time what it’s going to do next. Figure 1: Top left: Mick Fanning in the barrel in a crowded Snapper line-up. Top right: Same image, but with a schematic of the coordinate system that the retina and visual cortex use to interpret our visual world. Red indicates Fanning’s direction of gaze and the orange spot indicates the center of where he is looking. The colors in the schematic match the colors on the brain images in the bottom row. Both the visual angle (blue) and the eccentricity (or distance from the center; white) are systematically mapped on the retina and in dozens of areas in the human brain. Bottom left: Medial view of an example brain (dotted line indicates zoomed portion at right). The dark gray pixels are indentations of the cortex (think valleys) and are typically hidden from view because the brain is folded up. The light gray pixels are gyri (think peaks). Bottom middle: As Fanning stares at the surfer’s head, this image is represented in multiple maps in visual cortex. One such map is shown here, where the red colors indicate those that are representing the surfer’s head. The dark blue colors represent the lip of the wave. Bottom right: In addition to an eccentricity map, there is also an additional map of visual angle. So, the lip of the wave is also represented in the red/purple band in this image. The take home point is that the visual system represents our visual world in a series of multiple maps distributed throughout the brain. 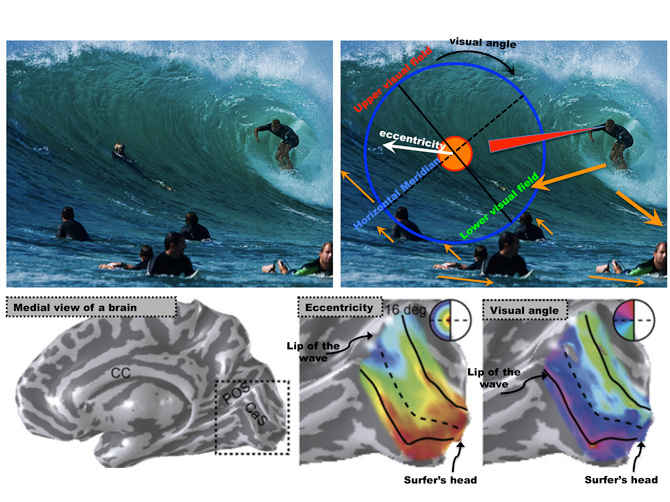 Appealing to all surfers, the scientific methodology used to map these areas delineated in the bottom row is referred to as the traveling wave technique (Brain images modified from Wandell et al., 2007; see suggested reading for further details).